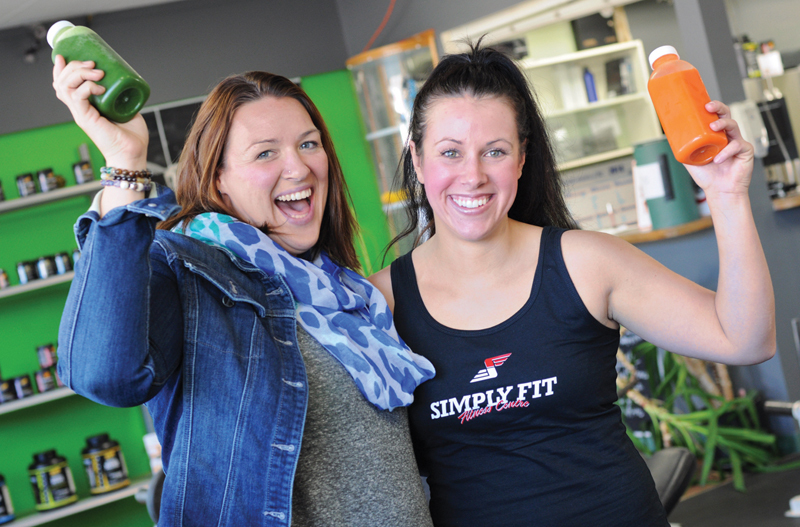 Simply Fit co-owner Allia Schofer (left) and Fit and Fresh owner Tori Colonel. When Fit and Fresh opened in downtown Creston in May to offer fresh juice, smoothies and fitness supplements, owner Tori Colonel thought it seemed somehow incomplete. Four months later, she teamed up with Simply Fit — a move that made sense for both businesses. “It felt like the missing piece,” says Colonel. The owners of the gym at 1513 Canyon St. agree. A juice bar was part of the plan when Allia and Chris Schofer bought the gym from Dave Perrin three years ago. The bar didn’t materialize then, but as soon as Fit and Fresh moved in last month, customers were thrilled to pick up a protein shake after their workouts. That something can be one of four smoothies — vanilla, chocolate, strawberry, kale — or four juices, from the strawberry-banana-based Love Punch to the spicier Ginger Snap. The latter was the first success Colonel had while creating recipes with local foodie Annaliese Phypers. Colonel’s goal was to have juices that were healthy and also flavourful, so she and Phypers sampled a lot of attempts, some better than others. Colonel has two children and recently became a single mother. She’d previously worked for Labatt and was a forestry technician for J.H. Huscroft Ltd., and had explored well-being while working at Golden Herb Health Foods. But she always wanted her own business, so she went back to school, taking the self-employment program at Kootenay Employment Services, where a personality test said she should become a business owner. The program was a significant step toward turning her passion into a career. The two months leading up to Fit and Fresh’s May opening were busy ones — not only was Colonel training at KES and testing juice recipes, she was also renovating her original location in the 1400 block of Canyon Street. The juice bar opened in May to a great response, due partly to high-quality product — she offers Fit Supplements protein powder, creatine, pre-workout and other supplements — but also Colonel’s attention to detail when making her products. Smoothies, she says, must be thick and contain a lot of fruit. Two seasonal smoothies, pumpkin spice and apple spice, are in the planning stages and should be available later in the fall. Along with those, Fit and Fresh will also be offering Bulletproof Coffee, a drink purported to burn fat and boost brain power, and consisting of coffee, grass-fed butter and a supplement, Brain Octane. “It’s unbelievable how that fat and caffeine hits you,” says Allia Schofer. Fit and Fresh’s move to Simply Fit did more than simply combine two complementary businesses — it also allowed Colonel to lower her prices. “It made it more affordable for me to support my family, and pass on the discount,” says Colonel. And while being in the new location allows Colonel to focus on fitness, she’s pleased for the opportunity to keep her mind active, as well. To learn more about Fit and Fresh, call 250-435-0385 or find it on Facebook.